A coastal road trip reveals an unexpected side of Myrtle Beach, South Carolina. 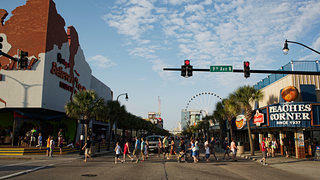 Myrtle Beach is not known for heritage tourism, though maybe it should be. Most of the South Carolina coastal city’s 14 million annual visitors go seeking more hedonistic pleasures—sunbathing, fried seafood, golf (regulation and miniature), and happy hour drink specials advertised on banners towed behind prop planes. 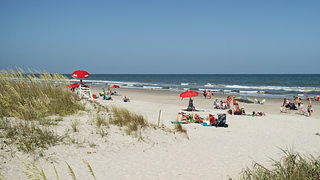 I know: I’ve spent more than 40 summers vacationing at a family house in the Ocean Drive area of North Myrtle Beach. As a kid, I loved the flash and attractions. Now that high-rise condos and hotels cast shadows on our two-story cottage, not so much. Lately, rampant development has stirred in me a pride of place—both in our 80-year-old, pine-paneled house, the survivor of two devastating hurricanes, and in Myrtle Beach itself. When my own children were younger, I busied myself on the beach with a round-point shovel, digging massive holes and building sand forts. Last summer, I dug instead into the hidden history of the greater Myrtle Beach region, known as the Grand Strand. The 60-mile coastline arcs from the North Carolina border to Winyah Bay, named after the Winyah Indians who originally lived there. I knew bits and pieces of the area’s recent past from stories told by my father. He was a toddler in 1935 when his family bought their beachfront house on a lonely dirt road cratered with axle-busting potholes (the same beach road that’s now lined with high-rises). One of eight children, he caravanned in cars stuffed with kids, suitcases, home-canned vegetables and fruit jellies, and live chickens to escape the stifling upstate heat. Cooled by sea breezes, he and his siblings fished and swam and gobbled down flounder fried in skillets on a wood stove. (You can still see the pine-paneling patch covering the old chimney thimble.) He recounted tales of wartime rationing, nighttime blackouts, and supposed German submarine sightings; about the postwar birth of the beach-music shuffle known as the Shag; and about how the family house remained standing despite direct hits from hurricanes Hazel (1954) and Hugo (1989). The region’s story, however, long predates the 20th century. Starting at the Grand Strand’s southernmost tip would allow me to work my way both chronologically and geographically back to Ocean Drive. The southern peninsula is Waccamaw Neck, named for the prehistoric Waccamaw Indians, who once hunted and fished the rich coastline. To get there, I took the King’s Highway (U.S. Route 17), so named because it follows the thoroughfare that once linked colonial Charleston to Boston. Familiar with bumper-to-bumper summer beach traffic, I quickly turned onto the Carolina Bays Parkway (Highway 31), a bypass built after an earlier bypass became too congested. 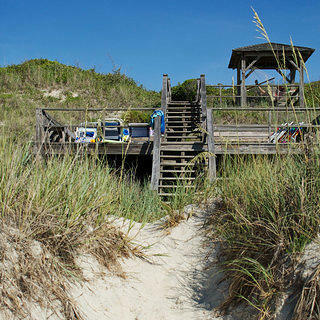 An hour later, I crossed onto Pawleys Island, the Grand Strand’s original beach getaway. Snaking south along the saltwater creek that separates the 3-mile-long barrier island from the mainland, I felt myself relaxing: no more traffic, no billboards or flashing signs screaming for my attention, only homes tucked among live oaks and fronted by wooden piers spanning the marsh grass. The ruins of Atalaya, the Moorish-style former home of Archer and Anna Hyatt Huntington. 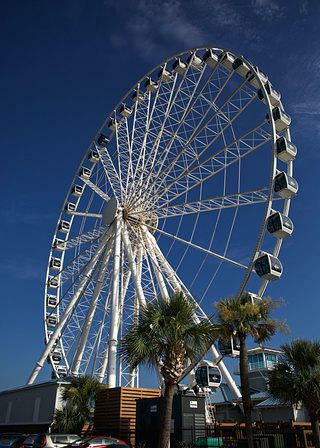 A more modern attraction, the Myrtle Beach SkyWheel. Starting in the late 18th century, Pawleys became a malaria-season refuge for area rice planters; steady breezes kept mosquitoes away. For more than half a century, as exports of Carolina Gold rice boomed, more and more families built cypress-sided summer homes atop brick foundations designed to withstand pummeling maritime storms. Each May, the mainlanders left their manor houses, bringing over enslaved workers, fine furnishings, and livestock. A dozen antebellum houses still stand, some with original slave quarters, mixed in among the 20th- and 21st-century beach cottages. Preservation is baked into the island ethos. Although a condo community popped up in the 1970s, locals have staved off all commercial development. Near the island’s southern tip, which is just wide enough for the road and a single row of houses behind the dunes, I crunched onto the oyster-shell drive of the P.C.J. Weston House, circa 1850, better known as the Pelican Inn. Ten minutes later, after meeting co-owner Corinne Taylor, I was rocking on a deep piazza framed by Carpenter Gothic arches, sipping lemonade from a sweaty glass. 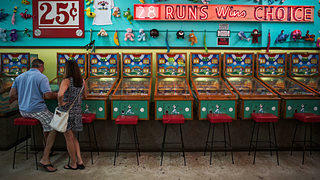 Inside the arcade at 75-year-old Fun Plaza in Myrtle Beach. Beachgoers enjoy sand and surf at Huntington Beach. Among the shops, amusements, and eateries of downtown Myrtle Beach is Peaches Corner, a family-owned diner. Its hot dogs, burgers, and hand-scooped ice cream have kept visitors happy since 1937. 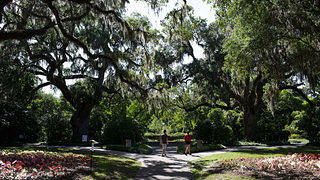 The lush landscape at Brookgreen Gardens. 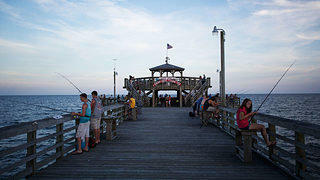 Cherry Grove Pier in North Myrtle Beach, where the author spends time each summer, was built in the 1950s. After the Civil War and Emancipation, the Low Country rice business, which depended on enslaved labor for profitability, was no longer sustainable. Not even the age of mechanization could support the industry; the muddy terrain was ill-suited for tractors, a fact that became obvious as I toured a former rice plantation by boat. I joined the hour-long excursion during a visit to Brookgreen Gardens, a 9,100-acre historic landmark and nature preserve 7 miles north of Pawleys Island on the malarial side of King’s Highway. (Don’t worry—South Carolina eradicated the disease by 1950.) America’s first public sculpture garden, Brookgreen Gardens was created in 1932 by wealthy Northeasterners Archer and Anna Hyatt Huntington. It is a wonderland of brick-and-oyster-shell paths, Spanish moss–draped live oaks, and nearly 1,500 sculptures by American artists. And it was the perfect next stop on my chronological tour of Grand Strand history. Perfect because it represents a sea change, so to speak, in coastal culture. After the rice planters went broke, Northern industrialists scooped up plantations at cut-rate prices. The list of names reads like a robber baron’s Who’s Who—du Pont, Vanderbilt, Guggenheim, Hutton, Whitney. Rather than escaping from summer mosquitoes, these outsiders sought refuge from winter snow and ice. They may come off as high-dollar carpetbaggers, but many are praised as accidental saviors who used the land for duck hunting rather than development and kept historic plantation houses from falling into oblivion. The Huntingtons, who came south from Connecticut in 1929, were so taken by Waccamaw Neck that they bought four contiguous plantations—Brookgreen, Laurel Hill, the Oaks, and Springfield—each of which “ran from the sweet tidal waters … to the bitter embrace of the Atlantic Ocean.” So reads an interpretive plaque I found at Atalaya, the couple’s 30-room retreat, which Archer, a Hispanic Studies scholar, designed to resemble a Moorish castle. 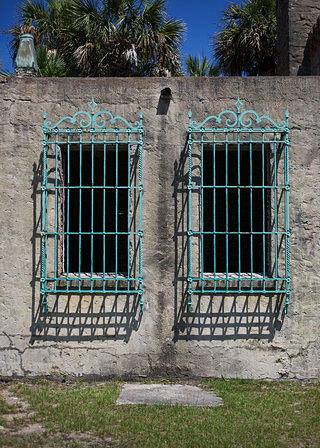 Today, Atalaya’s ruins are part of Huntington Beach State Park on land lying east of Highway 17. For the $5 park fee and an additional $2, you can wander through the eerily empty brick rooms, as well as Anna’s massive sculpture studio, where she kept caged bears and other large animals as models. 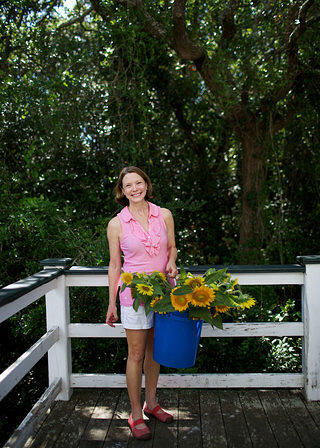 Corinne Taylor, who owns the Pelican Inn on Pawleys Island with her husband, Bruce. 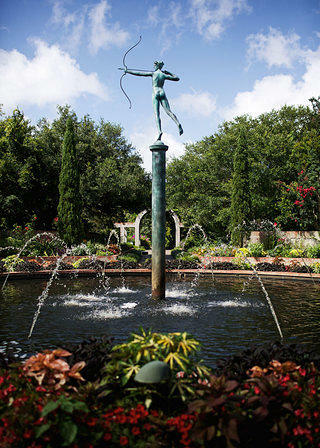 Brookgreen Gardens was the nation’s first public sculpture garden. You have to dig harder for material clues to the history of Myrtle Beach. Most have been churned up by development and redevelopment. In the late 19th century the enterprising Franklin Burroughs, based 15 miles inland, bought up the extensive coastal pine barrens. There he built a timber, turpentine, and construction empire known today as the Burroughs & Chapin Company. His ultimate vision was to create a resort destination to rival Coney Island and Atlantic City. Though Burroughs died in 1897, his heirs built a beach railroad and, in 1901, a hotel called the Seaside Inn. The developers sold beachfront lots for $25, offering an additional lot free to anyone who built a house valued at $500 or more. Burroughs’ widow, noting the predominance of wax myrtles along the dunes, named the new resort Myrtle Beach. The Seaside Inn is long gone, as is the outsize, Neoclassical-style Ocean Forest Hotel, built in 1930 and demolished in 1974. The Ocean Forest had it all—gardens, pools, stables, Grecian columns, marble stairways, Czechoslovakian crystal chandeliers. Tuxedos were de rigueur in the dining room, though standards loosened as times changed. By the late 1940s, Senator Strom Thurmond was playing volleyball in swim trunks. Unable to help myself, I followed flashing lights and the sound of dinging bells into an open-sided arcade called Fun Plaza. So much about this 75-year-old, family-owned place—the grimy concrete floor, industrial fans fighting to stir the sticky air, glass cases filled with prizes waiting to be liberated by hand-cranked claws or spring-loaded arms—conjured magical childhood memories. Despite everything I’ve learned in this life, I still found myself feeding quarters into those infuriating machines. When I asked a man with a coin-filled apron and jangling ring of keys which games were oldest, he pointed to a row of 1957 Williams Deluxe baseball games. Scanning the prizes hung from the wall, I set my sights on the smiling stuffed banana. I slipped a quarter into the slot and pressed a button, and a silver ball shot up from the pitcher’s mound before I could even find the flipper. Strike one. I was hooked. For the next 30 minutes, I played nonstop, spending a handful of quarters. I may not have won the stuffed banana, but the trip down memory lane was reward enough. ONLINE EXCLUSIVE: Learn more about Atlantic Beach, a historic African-American enclave in South Carolina. Logan Ward is a Fairfax, Virginia-based freelance writer and a frequent contributor to Preservation magazine. His work has also appeared in Garden & Gun, Outside, and Popular Mechanics.